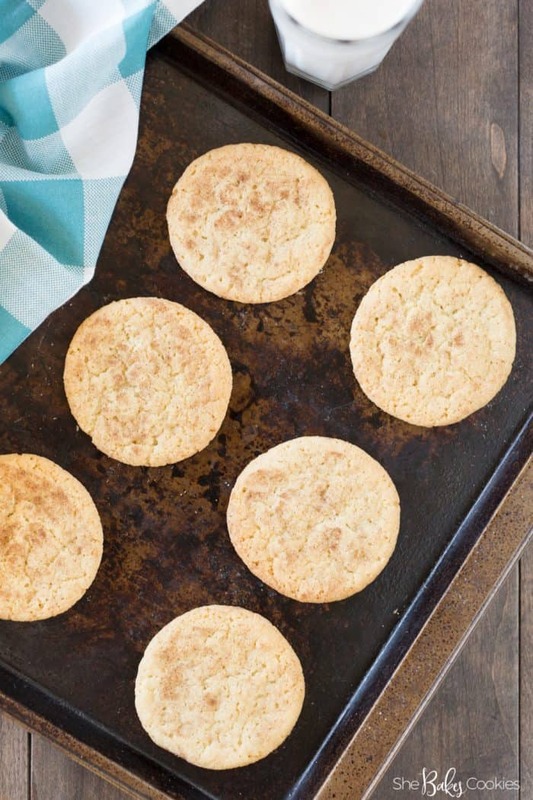 You’ll love this easy snickerdoodle recipe! You can quickly whip up delicious snickerdoodles in one bowl with no rolling required! Hey there! 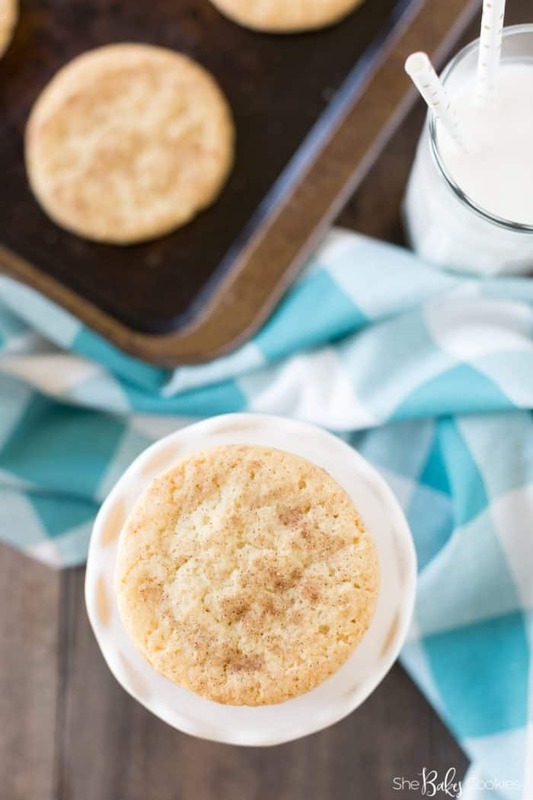 Kristine from She Bakes Cookies with a totally delicious easy snickerdoodle recipe for you! Wait a second. Hold the phone. Did you catch that? Are you confused? Kristine from She Bakes Cookies? What happened to Kristine from Kristine in between? Haha, oh yeah, that’s me too! Same, same. After months of thinking (and talking) about it, I’ve finally decided to follow my passion for cookies and start a blog dedicated to everything cookies! It’ been so much fun! I write about baking sheets, baking techniques, cookie baking tips, and of course I share tons and tons of cookie recipes! But, to answer your question, yes, I also still lifestyle blog over at Kristine in between too! What can I say, I’m a busy gal! Now let’s get back to the important stuff, these cookies! 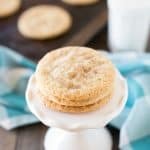 This is the best easy snickerdoodle recipe I’ve come across to date and I’ve tried many! Thick ones, thin ones, chewy ones, crunchy ones, and even a few disappointing ones, but these snickerdoodles are by far my favorite. These cookies have only a few ingredients. The instructions are super simple. You can whip them up in 30 minutes or less. This is a great recipe to make with kids. And the best thing of all, you can make them in one bowl with no rolling! Boom! 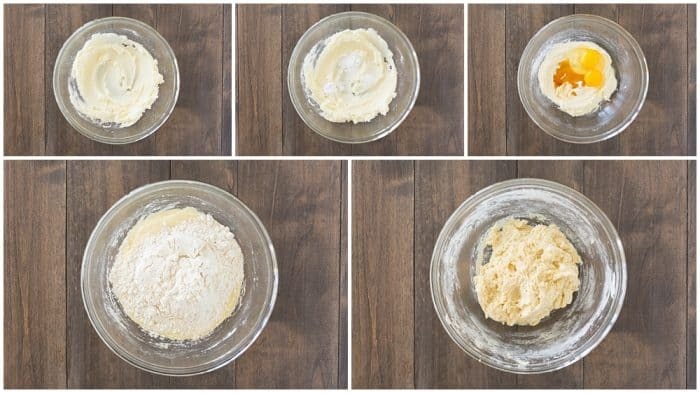 Only add half the flour at a time and do not over mix! Yes, friends! You read that correctly, one bowl and no rolling! 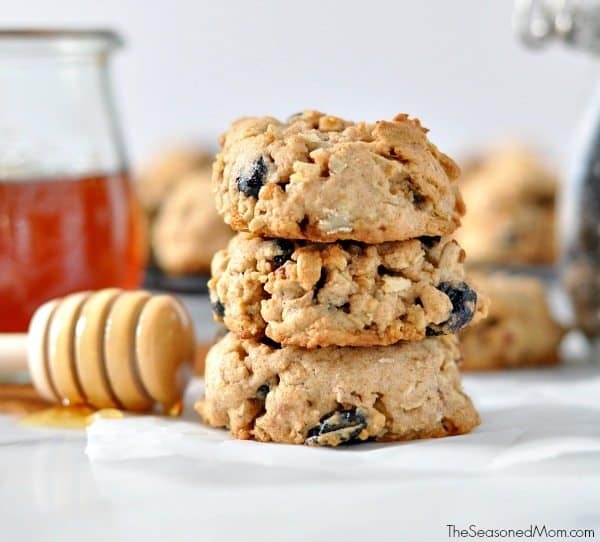 That makes these cookies the perfect weekday treat or a simple baking activity to do with the kids on Saturday afternoon! And I promise, your kitchen won’t even end up a total disaster! These snickerdoodles are of the thin and chewy variety, which I’ve really grown to love. They have a light texture and crispy edges. And they’re not overly cinnamon-y (yes that’s legit!). 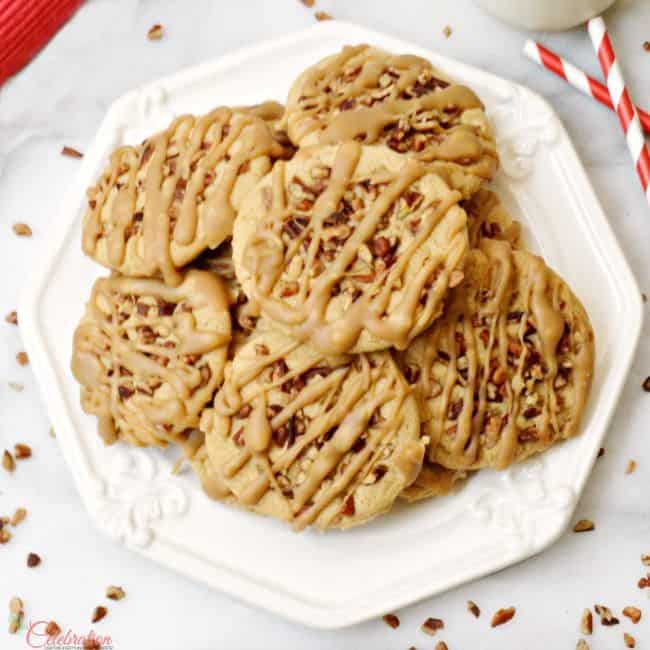 When you bake them in the oven, the cinnamon sugar mixture on the top starts to melt just a little bit, giving these cookies some crunch on the top. You’re going to love it! Crispy, crunchy, chewy, snickerdoodle perfection! When you get a taste for snickerdoodles, you’ll definitely want to reach for this easy snickerdoodle recipe! 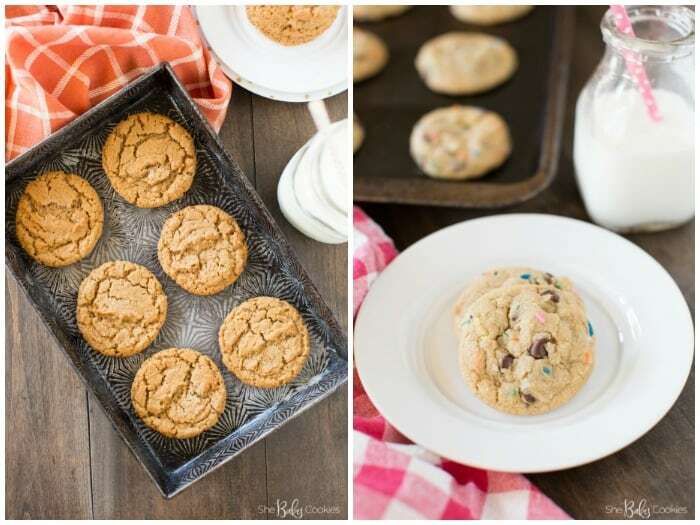 And if you’re looking for other yummy cookie recipes, try these flourless peanut butter cookies or these fun sprinkle chocolate chip cookies they both get two thumbs up from my peeps! Easy Snickerdoodle Recipe for The BEST Cookies EVER! An easy snickerdoodle recipe for thin and chewy cookies that require no rolling and can be made in one bowl! 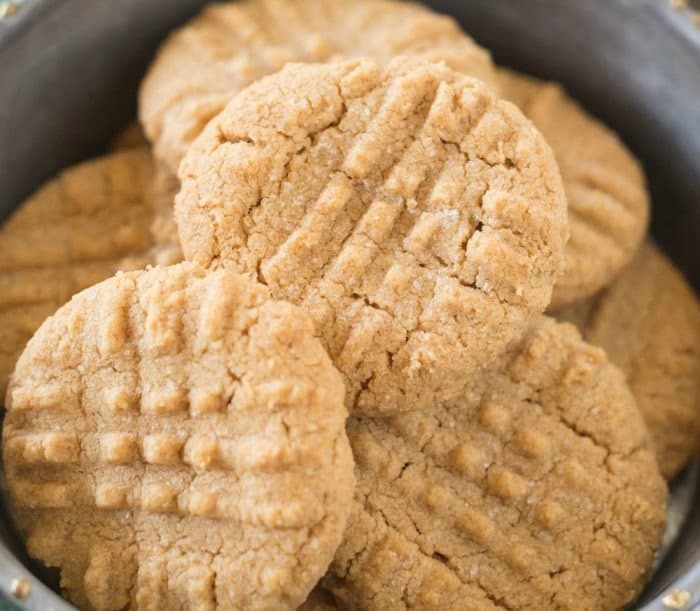 An easy snickerdoodle recipe for thin and chewy cookies that you can quickly make in one bowl. No rolling required! In a small bowl, mix together the 1/4 cup sugar and cinnamon until well combined. Set aside. In a large bowl, cream butter and sugar together until smooth. Add baking soda, salt, and water and mix well. Add egg and vanilla and stir to combine. Add flour, half at a time, stirring until combined. Do not over-mix. Using a 1 TBS cookie scoop, scoop dough and place on the cookie sheets 2 inches apart. Sprinkle the cinnamon sugar mixture over the top of each cookie. Bake cookies for 12-14 minutes, rotating halfway through, until just golden brown on the edges. Cool on cookie sheet for 5 minutes prior to transferring to a wire rack. 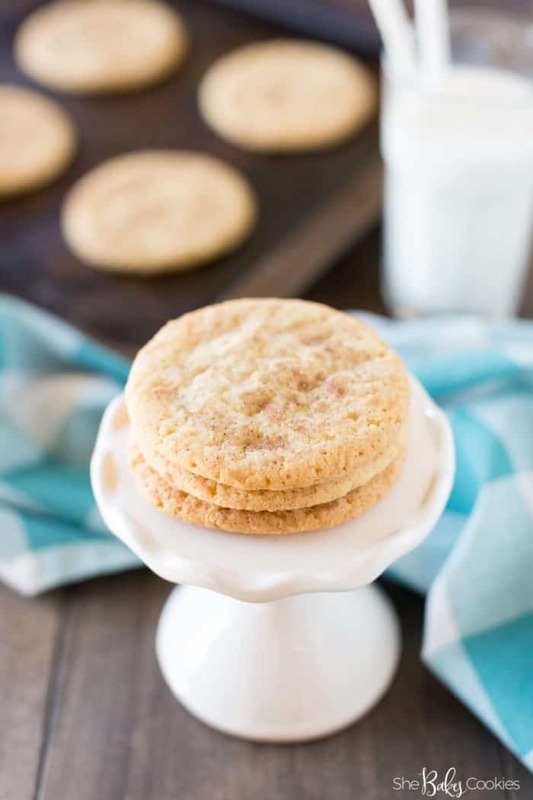 If you liked this Easy Snickerdoodle Recipe you might also like….